Max, the Dr. Seuss icon's trusty dog, will appear at the theme park party, too. The season that encircles the final month of the year like a big, bright ribbon is rife with pivotal moments, the kind of merry/magical moments that seem to tie the whole to-do together. There's the moment when the tree topper is placed atop the Douglas fir in the middle of the den, and the moment when the first carol is sung, and the moment when the first package is opened, and the moment when The Grinch ponders "I must stop Christmas from coming — but how?!" Bevies of Dr. Seuss devotees know that that's the linchpin of "How The Grinch Stole Christmas," but we typically only experience it through the book and animated classic. 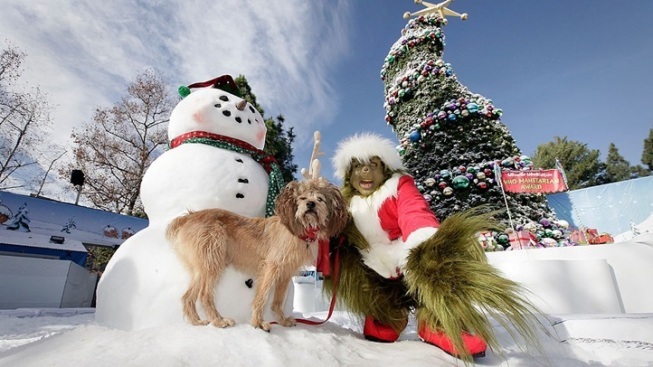 But make for Universal Studios Hollywood over any number of select December dates and you'll spy the furry, Santa hat-rocking peak dweller holding court, grandly, cheekily, and with his pup Max at his side. It's Grinchmas, of course, the theme park's yearly yuletide bon bon of a bash. No Grinchian gala would be complete without some Who-sweet singing, and that the singing is hailing from a backlot set seen in the live-action film only ups the "you're-on-a-studio-tour" specialness. There shall be storytime with Cindy Lou Who, and photos with the formerly grouchy Big G himself by his oh-so-Grinchy tree. Well, the height, at 60 feet, isn't Grinch-like in the least, but is rather generous and sparkly. Two things The Grinch eventually becomes, yes (and no spoiler alert is required, as many people know both the book and show by their heart). Speaking of hearts, will you ask The Grinch how it felt to have his heart grow three sizes in a single day? That is quite the feat, especially since he then had the strength of ten Grinches (plus two). Opening day for these Who-larious high jinks is Saturday, Dec. 3, while New Year's Day is when The Grinch will board his bag-packed sleigh and bid his fans adieu. It's not Grinchmas every day at the theme park, but things'll get quite Grinchly over the final two weeks in December (so check the full calendar). Universal Parks & Resorts is owned by NBCUniversal, the parent company of this site.